You'll find QR codes almost everywhere - in magazines and newspapers, on signs and posters, and even on billboards. Companies use them to promote their products and services and to direct consumers to websites where they can get more information. A new trend is for job seekers to include a QR code on their resume or business cards. It's not required, of course, but it can be a way to add a coolness factor to your resume and get your resume a second glance from a hiring manager. Having a QR code on your resume could help differentiate from the competition. Plus, if there is a particular online destination you want hiring managers to visit - like your online portfolio - it's a good way to encourage a visit. Here's more on using QR codes on your resume or business card to stand out from the crowd with a QR code on your resume from James Alexander, Chief Executive Officer, Vizibility, Inc.
QR codes are widely used on everything from movie posters to fast food placemats, but they're still relatively novel on resumes. It can work in your favor, especially if you're applying for a job with a large pool of applicants. The QR code may help you attract the hiring manager's attention, which is the crucial first step in getting hired. QR codes have a definite coolness factor, and their use instantly brands you as tech-savvy - as someone who embraces emerging technology. If you're an older job applicant, QR codes can help inoculate you against age discrimination by underscoring that you're open to innovation. Did you know that around 2,000 people on LinkedIn share a name with someone on the FBI's 10 Most Wanted List? This can lead to a serious case of mistaken identity since the vast majority of hiring managers conduct Google searches on job applicants. QR codes are a great way to direct hiring managers to a site containing relevant links that showcase your thought leadership, career accomplishments, online portfolio or profile on professional sites like LinkedIn. These days, more than half of all online searches originate from a mobile device. QR codes are designed to be scanned with a mobile device, and there are free and affordable services that can enable you to quickly and conveniently build a mobile mini-site to showcase your talents and achievements. QR codes can serve as a gateway to your mobile-optimized site. With the right administrative tools, you can receive text or email alerts to monitor scans performed on your personal QR code, including the number of scans and geographical points of origin. It can help you gauge interest in your resume. 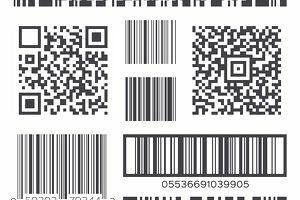 Additionally, when a user scans a QR code, the URL is saved in the user's mobile device, which can be an added advantage. Should You Use a QR Code on Your Resume or Business Card? There are a lot of perks to using a QR code. There are also some downsides. For one thing, many hiring managers may not be equipped to handle reading the QR code. In that case, it becomes a waste of valuable real estate. Also, hiring managers may expect to have your resume provide all the information needed on your work experience, and feel frustrated at the need to use the QR code to learn your full job history. Plus, consider how people will be viewing your resume. If they are reviewing it as a hard copy, scanning the QR code is easy. But if they are opening the document on their smartphone, how can they scan the code? If you're sending your resume electronically, a link to your portfolio or LinkedIn page will be easier on readers. Also, think through what information you'll have at the destination of your QR code. What does your LinkedIn profile offer that your resume does not? Could you incorporate that information in your resume or cover letter? Whatever destination you use for your QR code, make sure it is providing professional information that will further your campaign. If people do take the time to scan your QR code only to wind up on a site full of typos and formatting errors, that won't help your candidacy. Before investing the time to create a QR code, ask yourself if it will be advantageous to have it on your resume, and consider how the people viewing your resume — hiring managers and interviewers — are likely to react to it (this can vary, depending on your industry).